Lowell Thomas decided right off the bat — and Merian Cooper, when he came aboard, concurred — that the star of the first Cinerama picture would be Cinerama itself. “If Charlie Chaplin had offered to do Hamlet for us,” Thomas remembered, “I’d have turned him down. I didn’t want people judging Chaplin or rediscovering Shakespeare…The advent of something as new and important as Cinerama was a major event in the history of entertainment and I was determined to let nothing upstage it.” In other words, This Is Cinerama wasn’t a movie, it was a demonstration, just like Waller and Reeves’s screenings at their tennis court command post in Oyster Bay. The difference this time was that the presentation was more organized and formal, with tuxedo-clad personnel escorting the audience to their seats — and it was in Technicolor. (Mostly, anyhow; when opening night loomed and the feature was still a little short, Thomas and Cooper decided to splice in Waller’s black-and-white clip of the Long Island Choral Society singing Handel’s Hallelujah Chorus — it made a good demo of the sound system, with an invisible choir marching down the aisles of the theater before coming into view on the screen.) So in a sense, Cinerama was exactly where it was before the opening — only now the whole world was watching. The first new development, barely three weeks after the premiere, was the appointment of Louis B. Mayer as chairman of the board of Cinerama Productions Corp. (with Lowell Thomas stepping down to vice-chairman). There was a certain irony in this; Mayer was one of the movie industry figures who trooped out to Long Island for those demonstrations, only to take a pass on investing. Back then, Mayer had been probably the most powerful man in Hollywood, but this was now. In the interim had come the ugly power struggle at MGM between Mayer and Dore Schary, and the humiliating palace coup that had sent Mayer packing in July 1951. By October ’52, Mayer was restless in forced retirement, and Cinerama looked like his passport back into the business. For Cinerama it was a windfall in both money (Mayer’s personal investment reportedly amounted to over $1 million) and prestige: Mayer’s status as a pioneer and longtime chief of the Tiffany of Hollywood studios gave an aura of solidity to Cinerama, and his reputation for showbiz acumen was expected to reassure and attract investors. He brought along some possible material, too: Mayer personally held the screen rights to several properties. One of them, Blossom Time, a moldy Viennese operetta of the sort Mayer had once so lovingly dusted off for Nelson Eddy and Jeanette MacDonald, would never do. But others might work very nicely, like the Lerner and Loewe musical Paint Your Wagon and the Biblical epic Joseph and His Brethren. An array of productions were considered, and some even announced. Paint Your Wagon. Tolstoy’s War and Peace. A remake of King Kong. Lawrence of Arabia (this would have been a much different picture from the one we eventually got; Lowell Thomas didn’t much care for David Lean’s 1962 take on his old friend). Paul Mantz climbed back in the cockpit of his converted B-25 and shot another 200,000 feet, at a cost of $500,000, without anybody knowing when or how it would be used. Some of Mantz’s footage eventually wound up in Seven Wonders of the World (’56). But as for these other ambitious plans, none of them ever came to pass. Part of the reason was L.B. Mayer himself. Biographer Scott Eyman speculates that Mayer’s enthusiasm for Cinerama was never that great in the first place; he may have been clinging to the forlorn hope that his exile from MGM was only temporary, intending Cinerama as a base from which to stage a return to Culver City. 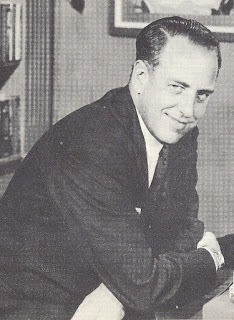 Whatever his intentions, the battle with Dore Schary had left him, in Lowell Thomas’s words, “aging, tired [and] unable to make up his mind about anything.” (Eyman memorably quotes writer Gavin Lambert, who covered Mayer at the time, in almost the same words: “He was an aging, tired man in a dark suit, who looked like a businessman but was actually an exiled emperor.”) Mayer eventually left Cinerama, though sources vary on exactly when. 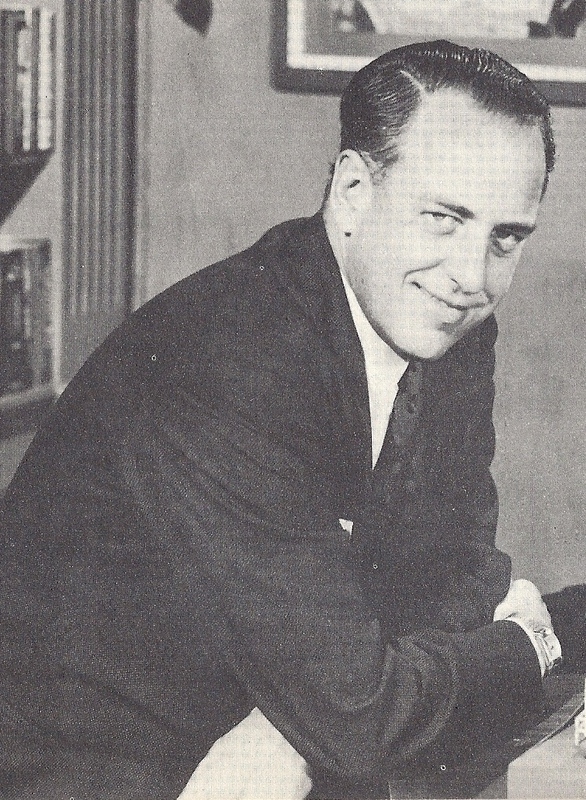 Eyman dates Mayer’s departure to November 1954; Thomas Erffmeyer’s history implies (and an article in the Winter 1992 issue of The Perfect Vision says outright) that it may have been as early as May ’53. In any event, Cinerama Productions Corp. produced nothing under Mayer’s chairmanship, and frittered away much of its early momentum. Vitarama Corporation. This was the original corporation set up by Fred Waller and Ralph Walker in 1938, when Waller designed that petroleum industry exhibit for the 1939 World’s Fair (which was never used, and which morphed into the Waller Flexible Gunnery Trainer). A private corporation owned by Waller (43 percent), Walker (14 percent) and Laurance Rockefeller (43 percent, an interest Rockefeller retained when he sold his interest in Cinerama to Buz Reeves in 1950), Vitarama owned all the basic Cinerama patents and received a percentage of the box office take. Cinerama Productions Corporation. Privately owned like Vitarama Corp., this was the successor corporation created when Mike Todd was squeezed out of Thomas-Todd Productions. Lowell Thomas was originally chairman of the board; president was Dudley M. Roberts, a Wall Street broker who joined the crew — and brought along a cadre of other investors willing to buy in — once the loose cannon Todd was out of the picture. 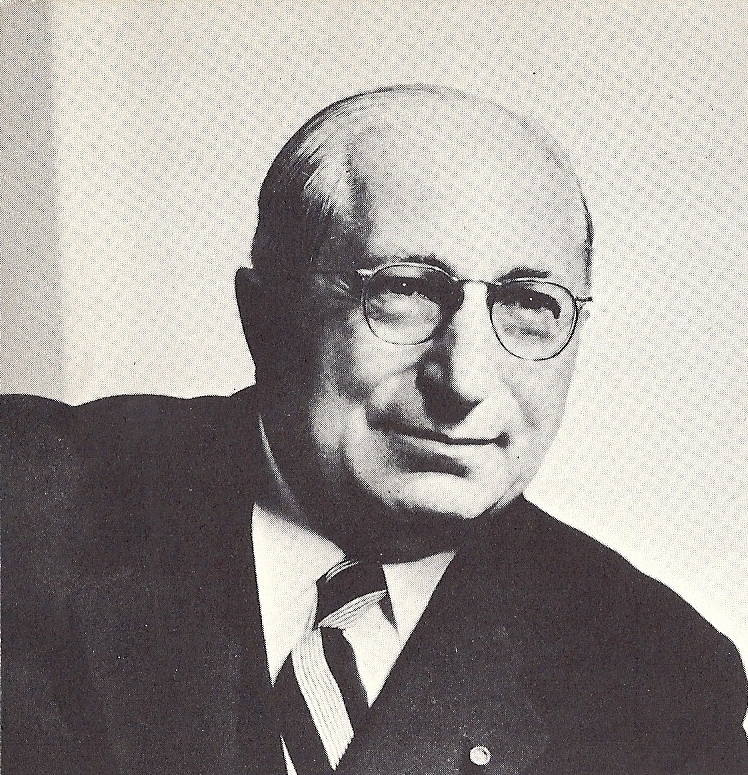 This was the corporation that enlisted, and later regretted, Louis B. Mayer. 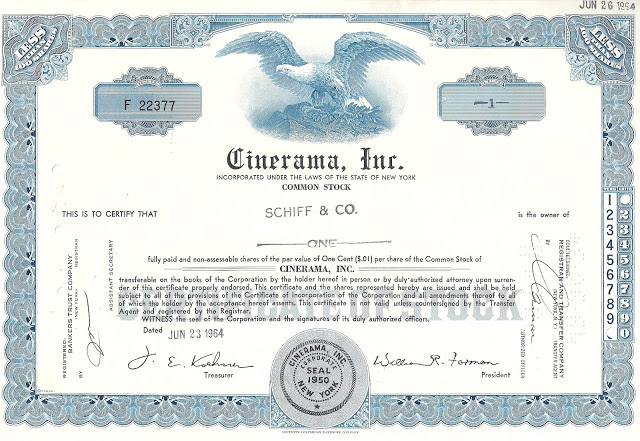 The financial arrangements among these corporations were a real can of worms: Cinerama Productions Corp. paid profit royalties to Cinerama Inc., which paid a percentage of those to Vitarama Corp., which licensed the manufacture and use of its equipment to Cinerama Inc., which sub-licensed production and exhibition to Cinerama Productions, which bought the equipment for its theaters from Cinerama Inc. In the flurry of excitement after the premiere of This Is Cinerama, the price of Cinerama Inc. stock had soared from $4.00 to $8.00 a share. But when investors, who thought they were buying into “Cinerama”, realized they were buying stock in the manufacturing company while most profits would go to the production company, the price fell back to $5.25. Some brokerage houses cautioned against Cinerama Inc. as a “speculation”, and stock-sale income dropped off accordingly. Besides which, Cinerama was a high-overhead operation — requiring, for example, 12 to 16 projectionists, plus a technician to channel the six soundtracks into the appropriate surround speakers, and a “theater engineer” manning a master-board overseeing the synchronization of the whole operation. While the box-office take was huge, profits were minimal, and it was the profits that trickled over to Cinerama Inc. and Vitarama Corp. Moreover, it was profits from which Cinerama Productions Corp. needed to buy the equipment to convert additional theaters to the process. All these factors contributed to cash-flow problems for the three Cinerama companies, and it made Cinerama Productions, which was both taking in and spending most of the cash, ripe for a takeover. And that’s just what happened in the spring of 1953, even as two new Cinerama theaters held triumphant openings in Detroit (the Music Hall on March 23) and Los Angeles (the Warner, April 29). I’ll get into that takeover next time. Two other players entered the game about this time, and they put some new wrinkles on the playing surface. One was 3-D, which actually came along (with the surprise hit Bwana Devil) before This Is Cinerama opened; in the sudden interest in movies-with-a-difference, 3-D began to look like a cheaper alternative to Cinerama, and a number of studios grasped at it. As things turned out, 3-D fizzled within the year and wouldn’t make a real comeback for another half-century. Great site, Jim. For the 60th anni, I've opened mine as well: thiswascinerama.com. I came into possession of most of Hazard Reeves' Cinerama and your comments about the lack of foresight conerning Fox' CinemaScope is right on. Of the 2000+ articles in his memorabilia from 1952 through 1959, there was only once single mention of something upcoming called "cinemascope." They simply weren't worried. A copy of the Reeves collection is in the Performing Arts Library at Lincoln Center, and it (long story) includes a few items not in mine. Relevant to this post…there's a ticket to the world premiere of "The Robe" personally signed by Skouras and addressed to Mr. and Mrs. Hazard Reeves.